Hey there! Thanks for dropping by Gef's Football Club! Take a look around and grab the RSS feed to stay updated. See you around! Cameroon have won a friendly football tournament (LG Cup) after they defeated Morocco 4-2 during a penalty shoot-out. Both teams were tied 1-1 after regular play time and had to revert to penalties to have a winner as per the rules of the competition. Samuel Eto’o, Henri Bedimo, Dany Noukeu and Enoh Eyong scored their spot kicks for Cameroon while while Morocco missed two of theirs. Cameroon may have won but Morocco were the better playing side for most of the 90 minutes (plus injury time). Their short passing was precise, with regular one-twos and give-and-go passes that ran the Cameroon midfield ragged. The Indomitable Lions were playing a 4-3-3 where the fullbacks were expected to bomb forward to create width and support the attackers but Morocco played so high-up and at such high tempo that, Bernard Angbwa (right-back) and Henri Bedimo (Left-back) were hemmed-in for most of the encounter. Two games in two days may have stretched the Indomitable Lions physically. They were forced (by a deluge of injuries) to start with the same that played against Sudan on Friday. However, in a very Cameroonian never-say-die spirit (which had been missing for a while) the team refused to lose. By the 75th minute when Eto’o scored the curtain-raiser, the Moroccans had obtained 8 corner-kicks to Cameroon’s none. The Moroccans also squandered several goal scoring opportunities, often shooting wide but also denied by the impressive N’Dy Assembe in Cameroon’s goal. Towards the last 15 minutes of the first-half and during a 15-minute spell before and after Eto’o’s opener Cameroon, however regained the upper-hand. Enoh, Landry N’Geumo and Alex Song fighting for every ball and blocking every space in midfield. The technique from young Vincent Aboubakar and substitutes Edgar Salli and Jacques Zoua temporarily shifted the balance of power. Were it not for for a really poor final shot from Jean Makoun after a superb combination, Cameroon would have been 2-nil up before the Moroccans equalised. The Olympiakos player who is not a first choice for Cameroon anymore surely lost the little sympathy fans still have for him. It is not unusual for Cameroon to win games and tourneys without being the most pleasing side to watch. The Junior Lions typified this Cameroonian quality during the African Youth Championships and the U-20 World Cup tournaments this year. Nonetheless Cameroon fans have already started complaining about the 4-3-3 formation that coach Denis Lavagne is using. (Does that sound familiar Mr Le Guen?) Many have suggested on online forums that Cameroon hasn’t got the players for that system so the team should return to a 4-4-2 formation that will provide natural width. I don’t really fancy Cameron playing a system that hinges on wide men. They do not have the players that Sir Alex Ferguson’s Manchester United and Harry Rednapp’s Tottenham have got. 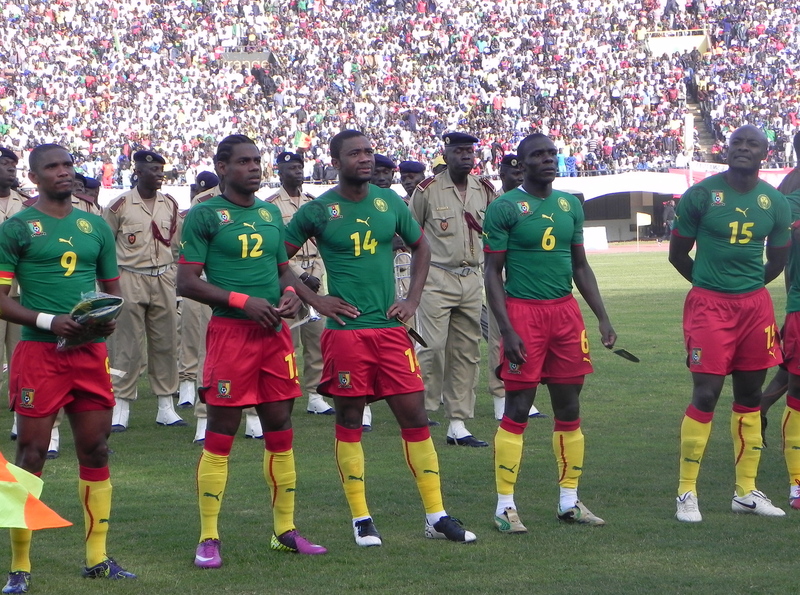 Does Cameroon have Nani, Ashley Young, Gareth Bale and Lennon type players? The country produces mostly players who feature in the centre of the pitch (centre-backs, central midfielders and strikers). Only the list of centre-backs and defensive midfielders could make up a squad: Nicolas Nkoulou, Stephane Mbia, Aurelien Chedjou, Sebastien Bassong, Yaya Banana, Dany Noukeu, Guy-Armel Kana Biyick, Andre Bikey, Joel Matip, Alex Song, Eyong Enoh, Landry N’geumo, etc. Indomitable Lions coaches have resorted to playing systems where they can adapt some of the strikers as wide forwards (but not wingers) or playmakers or given creative roles to otherwise defensive midfielders. This has usually meant playing formations such as 4-2-3-1, 4-3-2-1 (a.k.a Christmas Tree) and 4-3-3. When they have tried playing 4-4-2, they have been forced to use fullbacks (such as Henri Bedimo) as wingers, drawing the ire of the same fans and media calling for a return to ‘simple ways’. A compromise between playing 4-4-2 and fitting the kind of players at the disposal of Cameroon’s coaches would be to play a diamond midfield: a holding midfielder, a playmaker behind two strikers and 2 shufflers running the channels in midfield (playing narrow) but not wingers. Although, I’d advise the managers to do things as they deem right for the team, they might want to try a diamond midfield against a relatively weaker opponent. Isn’t it one of Martin Ndtoungou Mpile’s (deputy head coach) favourite formations? However, there’d be little width except the fullbacks join in (requiring a lot of defensive and attacking duties for them). The game would be overly dependent on the playmaker being able to click creatively but also supporting the defence. Cameroon’s Joel Matip scored on Sunday (21 August) for his club in the German Bundesliga but that hasn’t made headlines in a weekend where the name Cameroon has mainly been associated to Samuel Eto’o’s big money move to Russia’s Anzhi Makhachkal. Eto’o will certainly keep making the headlines in the coming week, as he finally signs the contract that would see him earn 20 million euros and become the world’s best-paid footballer. But we prefer to focus on the Cameroon internationals who have been in action across Europe. Joel Matip contributed to Shalke 04’s fantastic come-back from two goals down to beat Mainz 4-2 on Sunday. Matip started as one of the two central midfielders in Shalke’s 4-2-3-1 formation. He scored the third goal for Shalke at the 81st minute of play. Cameroon’s head coach Javier Clemente who has consistently refused to select Matip says the youngster is not mobile enough and is more for the future than the present. Eric Maxim Choupo Moting came on as a second half substitute for Mainz but he was not able to repeat last week’s performance where he scored for his new club. However, Cameroon national team coaches should be happy to see him having regular game time. Marcel Ndjeng started and played 83 minutes for Augusburg in their 2-0 defeat to Hoffenheim. Ndjeng has not been called up for the Lions since the 1-1 draw with the DRC in October 2010. Nicolas Nkoulou played the full 90 minutes at the heart of Olympic Marseille’s defence in their goalless draw with AS St.Etienne. He was calm and assured and made some good long passes to his strike partners. Henri Bedimo started at leftback for Montpellier when they beat Rennes 4-0 to go top of the French Ligue 1 standings. Georges Mandjeck started in central midfield for Rennes and played the whole game. Mandjeck last featured for the Lions as a second-half substitute against Senegal in Dakar last March. Moukandjo Bile started his first game for Nancy this weekend after a move from Monaco at the start of the week. Nancy lost 1-2 to Sochaux and Moukandjo was substituted after an hour. He was replaced by another Cameroonian – Alo’o Efoulou who has not been selected for the Lions for about 18 months. Lille beat Caen 2-1 with Aurelien Chedjou playing at right-back for the French Champions. Chedjou has been playing in central midfield for Cameroon since the World Cup in South Africa but normally plays as a central defender for Lille. For how long would he be deployed at right-back and how would that affect his game? Landry Nguemo started as the sole holding midfielder in Bordeaux’s diamond formation as they drew 1-1 with Auxerre. Gaetan Bong played at left-back for Valencienne in their 1-2 defeat away to Paris St. Germain. Henri Bienvenue Tsama came on at half-time but could not save his Young Boys Berne side from a 2-0 defeat in the hands of FC Thun. Chris Mbondi, U-20 international, came on as a 49th minute substitute for FC Sion as they beat Lausanne Sport 2-0. Somen Tchoyi started again as a second striker for West Bromwich Albion against Chelsea in the Premier League on Saturday. The Cameroonian worked very hard but his team were beaten 2-1 by their West London hosts. Tchoyi was substituted after 75 minutes. George Elokobi came on as a very late substitute (90th minute) for Wolverhampton Wanderers as they beat Fulham 2-0. Aston Villa defeated Blackburn Rovers 3-1 but Cameroon’s Jean Makoun watched from the bench throughout the game. Alex Song started his 3 match ban after stamping on Joey Barton last week and was thus absent from Arsenal’s 0-2 defeat to Liverpool. This Monday Benoit Assou-Ekotto and Sebastien Bassong’s Tottenham Hotspur travel to Manchester to face the Premier League Champions. (We’ll update once the game is over). Cameroon’s head coach Javier Selected has picked a team with more attack minded players to start against Senegal in Yaounde this Saturday. He has included three youngsters: Aboubakar Vincent, Benjamin Moukandjo and Eric-Maxim Choupo-Moting. They will support Samuel Eto’o while he dropped Aurelien Chedjou and Henri Bedimo to the bench. Gaetan Bong replaces Assou-Ekotto at left back while the rest of the defence remains unchanged with Amgwa Benoit (RB) and the duo Nicolas Nkoulou and Stephane Mbia as centre-backs. Enoh Eyong and Landry Nguemo will play in the midle of the pack. Here is the team: Kameni ; Angbwa – Mbia – Nkoulou – Bong ; Nguemo – Eyong – Moukandjo -Choupo – Aboubakar ; Eto’o. George Elokobi, the Wolverhampton Wanderers defender, has been included in Cameroon’s squad to face Senegal on 26 March in Dakar. He is part of three-man additional list that includes Joel Matip and Benoit Assou-Ekotto. The list was published late Friday in Yaounde. Elokobi recently told the British media about his deep wish to be called up to represent his native land has seen his efforts on the field pay-off. 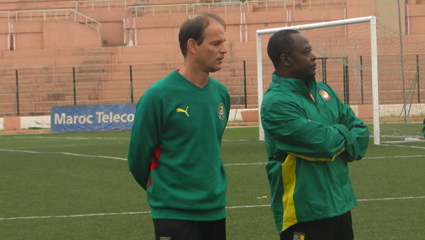 He replaces the injured Gaetan Bong who was on the initial 23-man team summoned to camp Javier Clemente, the Spain-born head coach of Cameroon. Many observers were surprised that Clemente had picked Bong in the first place, as it was well known that the defender has been out of action for a month. Benoit Assou-Ekotto of Tottenham Hotspur, who is probably Cameroon’s best left-back at the moment is also called up to defend his national colours. A national team insider told Gef’s Football Club that Clemente is punishing Assou-Ekotto for perceived indiscipline but it now seems public and government pressure has swayed the Spaniard (see separate story on Gef’s Football Club). Roger Milla, Cameroon’s football legend, had taken offence at Clemente’s decision to leave out some players who have been performing in their clubs on the grounds of discipline. “Those who have compiled this list (team selection) do not like Cameroon. You cannot suspend players and claim to have the best team… If you want the best team, you call everyone,” Milla is quoted as saying. However, as suggested by a poster on Gef’s Football Club, it is about time Cameroonians stop focusing on who’s absent and concentrate on supporting those included in the squad. “Those who have been called up should take the challenge and make Cameroonians proud by bringing home all 3 points,” Ensah Bertrand said in a comment on a strory about Elokobi’s fortitude. The man born in Mamfe, joins vice-captain Eyong Enoh and Mbuta Adongcho to bring to three the number of Cameroonians from the English-speaking part of the country who are part of the expedition to Dakar.